Our earrings are mostly “post” style. Post earrings have a straight rod that goes through the ear lobe and a removable backing to hold them in place. 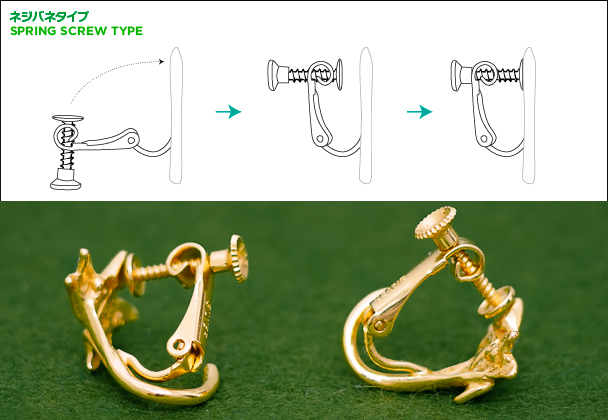 The post is usually located towards the top of the earring so that the earring does not tip forward. The diameter of the standard post is 1.0mm for many of our earrings, however it is also possible to make earrings with a thinner 0.75mm post upon order. As we use Britannia Silver 958, containing less impurities which cause metal allergies such as nickel, the thin post can easily bend (it can easily be repaired). 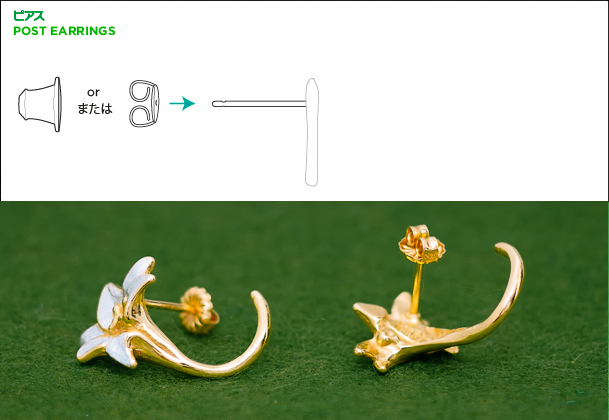 Alternatively, upon order we can attach thin 0.75mm 18K gold posts to Britannia Silver earrings for JPY5,000 extra. We use two types of catches, depending on the weight of the earrings. Spring clip earrings with a post are used for heavier earrings, or earrings where the post is located towards the centre of the back of the design. This allows the earrings to sit higher on the ear lobes, and prevents them from hanging on an angle, which it would without the Spring clip element. The straight rod of the post goes through the ear lobe and is secured by the Spring clip (no catch necessary). The metal of the clip is surrounded with silicon, making them comfortable to wear and resist slipping. 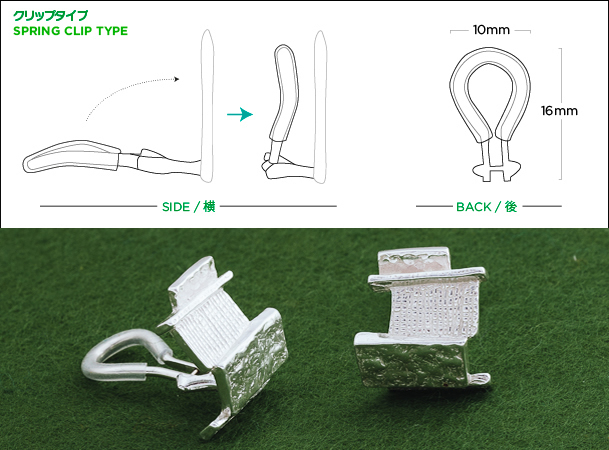 “Spring clip” type clip-on earrings have a very stable clip. The metal of the clip is surrounded with silicon, making them comfortable to wear and resist slipping. We use this type when the body of the design is large. Ear lobes come in all shapes and thicknesses, and although this type cannot be adjusted by yourself, we are able to calibrate them for you at our Ginza store/workshop. 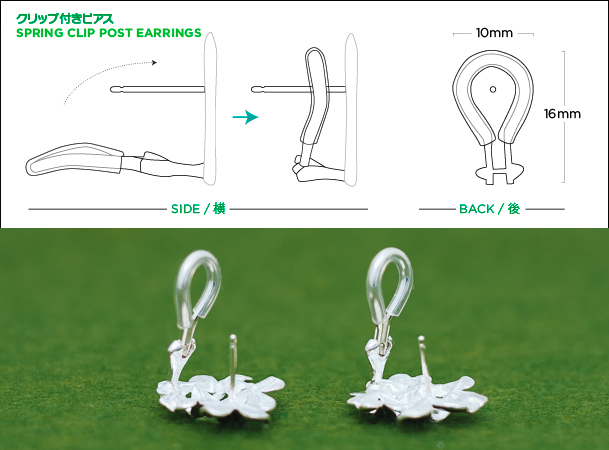 “Spring screw” clip-on earrings have an adjustable screw. They can be bent back and then once on the ear lobe, they can be fitted by tightening the screw. We use this type when the body of the design is small. Nickel is the most common cause of metal allergy with jewelry, especially pierce-type earrings. Atelier Shinji Ginza pieces are not plated with Rhodium (which contains nickel), therefore normal metal allergy sufferers can generally wear our pieces safely. Please see our Jewelry Care Guide for more information on metal types.